Dubai epitomises the grand and glitzy holiday destination, full of celebrities and six-star resorts, not to mention artificial islands and the tallest hotel on earth. However, it’s also a place where a cheap holiday is not entirely out of the question. For example, travel to Dubai might be cheaper on a weekday; try a Tuesday or Wednesday, for example. Taking a different route to Dubai might be cheaper too, if you can afford to be flexible. Since May to September tends to contain the most sweltering months, air fares can be lower. Sometimes, when there are special festivals on the go in Dubai, like the Shopping Festival early in the year, a cheap Dubai flight can be possible too. After your seven-hour flight direct from London, accommodation doesn’t have to cost an arm and a leg. Look out for cheap, but reasonable quality hotels. For affordable hotels, look out for names like Centro and Ibis. Or, another idea is to consider going self-catering and rent yourself an apartment, a great idea if you’re in a larger group. Eating out can be very reasonable in Dubai if you eat more like the locals. Enjoy delicious mezze outdoors in Beirut-style cafes on Al Dhiyafah Street. If you would prefer a good curry that’s very affordable, head for one of the very many curry houses on the World Trade Centre Road. Shop in one of the many malls of Dubai and the prices are very reasonable, but for real discounts, the Karama Discount District is an antidote to the world of the super malls. Obviously, wherever you are shopping in the more traditional souks and bazaars, the golden rule is to haggle, haggle, and haggle some more. That’s particularly true in the three areas where Dubai excels. In the Gold Souk, the expert jewellers will make up your designs on extremely reasonable terms. For hand-made suits at a fraction of the High Street price, and tailored to your precise measurements too, the many Indian tailors in Dubai will oblige. Finally, for beautiful Persian rugs, the name to remember is Pride of Kashmir, full of rug bargains from Iran. Of course, after all that haggling, you might want to cool down with a swim at one of Dubai’s lovely beaches. Many of the hotel beach clubs will charge around £30 for the pleasure of access to a beach and its activities. On the other hand, you can spend less than a pound at the Al Mamzar Beach Park. 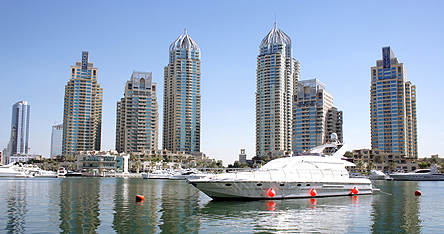 It’s a real melting pot of cultures as the various residents of Dubai come together to swim, play, cook, eat and relax. For the latest, cheap holiday deals to Dubai and other destinations, keep an eye on the ever-changing website offers at netflights.com.